Cuboid is a 3D object made up of 6 Rectangles. All the opposite faces (i.e Top and Bottom) are equal. 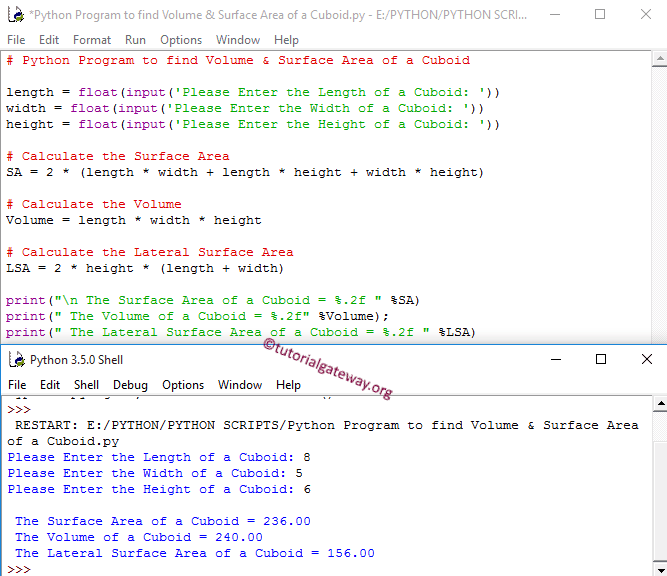 This Python program allows user to enter the length, width and height of a Cuboid. Using these values, compiler will calculate the Surface Area of a Cuboid, Volume of a Cuboid and Lateral Surface Area of a Cuboid as per the formulas. This program allows user to enter the length, width and height values. We will pass those values to the function argument and then it will calculate the Surface Area and Volume of a Cuboid as per the formula.